You can modify the output of Audio Source and Audio Listener components by applying Audio Effects. These can filter the frequency ranges of the sound or apply reverb and other effects. The effects are applied by adding effect components to the object with the Audio Source or Audio Listener. The ordering of the components is important, since it reflects the order in which the effects will be applied to the source audio. 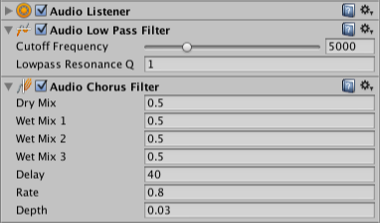 For example, in the image below, an Audio Listener is modified first by an Audio Low Pass Filter and then an Audio Chorus Filter. To change the ordering of these and any other components, open a context menu in the inspector and select the Move Up or Move Down commands. Enabling or disabling an effect component determines whether it will be applied or not. Though highly optimized, some filters are still CPU intensive. Audio CPU usage can monitored in the profiler under the Audio Tab.